How to create social media for mobile web sites and mobile web pages. PRINT2D offers a variety of mobile social media tie-ins to give mobile users access to your social networks. 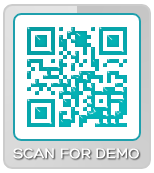 Mobile social media bookmarks can be triggered from a 2D barcode or from a link in a mobile landing page. Both options are direct to content. Downloads, YouTube®, Tickets and Reservations.